Kateřina Říhová is one of those people who chase every opportunity for education. Katerina received her Master’s degree in Law and then went on to attain a PhD, specializing in International Private & Commercial Law. She also studied International Law & Economics in Switzerland and Diplomacy at the Diplomatic Academy in Prague. During her postgraduate studies she worked in Brussels at the European Commission and stayed in Geneva at the Czech Diplomatic Mission to the United Nations. Moving seamlessly from commercial law to business, Kateřina chose to enroll in UNYP’s highly reputable MBA program in order to fill in a suite of missing skills which she believes are crucial in the business world. Kateřina credits UNYP Professor Samir Nassif as her champion, and one of the people who has changed her life. It is because of Professor Nassif that she became interested in innovative management, and was able to reflect and learn from her experience and mistakes. When completing a program on negotiation at Harvard Law School in 2014, Kateřina realized that she had already covered most of the curriculum in the Professor Nassif”s classes, which is a testament to the high-quality teaching provided here. Kateřina is currently working for Microsoft in Prague as the Business Manager for the GM of the Multi-Country region. Microsoft found her on LinkedIn and approached her on the strength of her MBA. After a series of assessments, she joined the company as part of their MACH MBA program (Microsoft Academy for College Hires with MBA). Kateřina’s core responsibilities at Microsoft include coordinating strategic planning, business operations, and execution. Before Microsoft found Kateřina, she was an entrepreneur. As a lawyer specializing in international trade law, WTO and international private law, Kateřina was able to use her extensive professional experience to set up the security company with a business partner in 2012. The company operates in the field of security technologies and delivering complex security solutions in the field of civil security, and surpassed several € million in turnover last year. Kateřina’s advice for being successful in the IT industry is to be open-minded, flexible and adaptable to change. Kateřina also believes that one must always challenge the status quo and be forward-thinking. 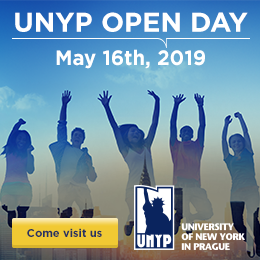 The UNYP MBA is a perfect opportunity for future business leaders to equip themselves with the skills and knowledge needed to succeed in the real world, and Kateřina is a perfect example of an ambitious individual making the most of her studies and striving for personal development and great success. We look forward to seeing what she achieves in the future.